After a series of winter storms, the Los Angeles Aqueduct is expected to flow at or near full capacity for much of the year. 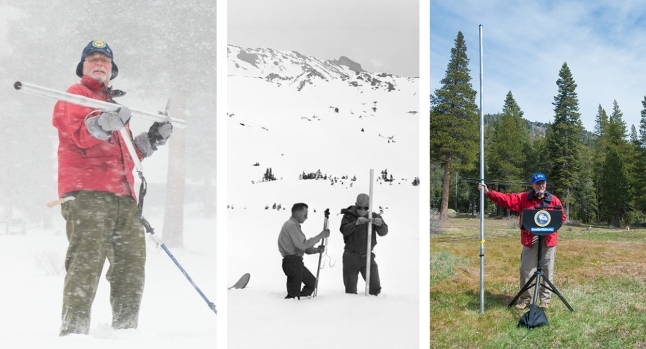 On April 5, 2019, Los Angeles Department of Water and Power hydropgraphers performed the final snowpack survey for the season in the eastern Sierra Nevada Mountains. 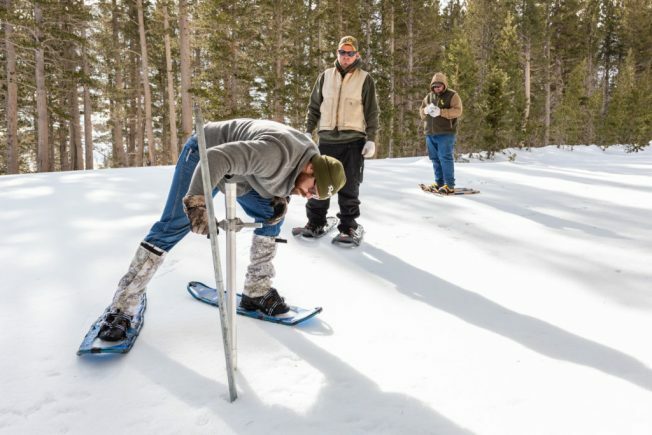 The final snowpack measurement in the eastern Sierra Nevada Mountains showed levels well above average after winter's unrelenting storms in California. The snowpack is an important measurement for water managers who determine how much water Southern California can expect to received from the Los Angeles Aqueduct, a system of channels and tunnels that stretches hundreds of miles from the eastern side of the 400-mile long Sierra Nevada Mountain range to Los Angeles. Snow in the mountains melts in spring, running off into the aqueduct and other water delivery systems around the state. Based on the snowpack survey, the Los Angeles Aqueduct will flow at or near full capacity for much of the year. Relying on gravity instead of pumping stations, the aqueduct spans more than 230 miles from the Owens Valley to Los Angeles. In an average year, it provides about half of Los Angeles' total water supply. 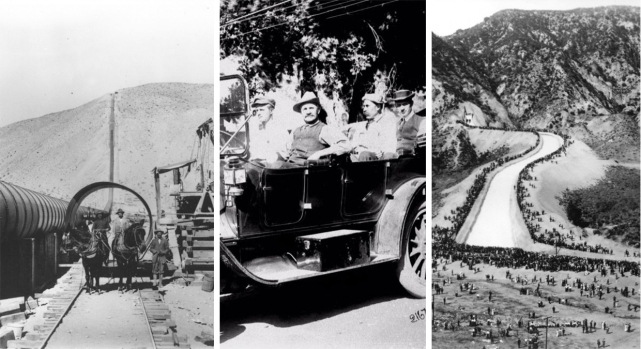 In the following 12 months, the aqueduct is expected to provside about 119 billion gallons, supplying water for about 70 percent of Los Angeles' water demand, according to the Los Angeles Department of Water and Power. This season's tall snow drifts are in sharp contrast to a dry 2018, when eastern Sierra snowpack was at 66 percent of normal. In 2017, snowpack levels were at 203 percent following historic winter storms. The three-year span illustrates the dramatic changes that stem from California's pattern of drenching winter storms and dry years. Statewide, snowpack was at 162 percent of average in early April. "This year's much needed rain and snow is encouraging for our short-term water supply. However, we know that droughts have become increasingly frequent and more severe and the next one is likely right around the corner," said LADWP General Manager David H. Wright. 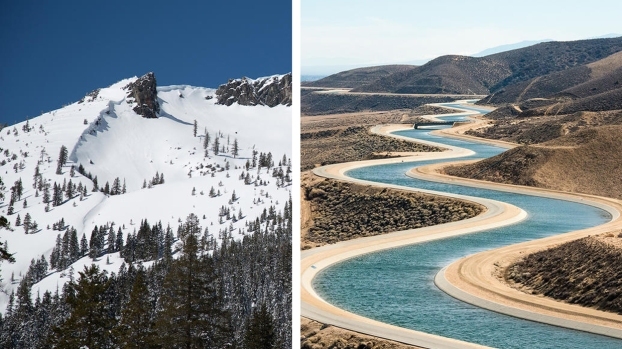 The snow along the Sierra mountain range melts in the spring in a traditional wet season, runs off into reservoirs ahead of the state's dry, hot summers and provides about 30 percent of California's water, much of it through the State Water Project -- a system of canals, tunnels and other waterways spanning the state. A weather phenomenon called an atmospheric river is a major reason for the puffed up pillow of snow in California's mountains. The bands of moisture in the sky over the Pacific that fuel colossal rain-making storms have contributed to some of California's wettest winters. Storms draw moisture from the rivers as they move toward California, sometimes unleashing days of steady rain on the West Coast. California has had more than 30 atmospheric rivers since the start of the water year in the fall with six in February alone, according to the department of water resources. In mid-March, California was free of drought for the first time since Dec. 20, 2011, according to the National Drought Mitigation Center. Just three months ago, 75 percent of the state was in moderate to extreme drought.